Picture-Directory Online has the capability to change the view layout for the Directory function. This is true for the List, Thumbnail and Detail views. For the Administrator or end user to initiate this function you need to click on the little wrench next to the Help function as seen below. Notice that there are setups for all three different views. One of the considerations in determining how to setup the views is the screen definition of the users. The issue here is how end users have their displays defined. Each user has access to change their individual view definitions and may require some help to make the proper changes. The defaults are shown in the Directory Viewing Preferences screen above. For the Detail View the picture width size can go from 270 to 900 pixels and the height size from 270 to 900 pixels. There is also a dependency when you enlarge the dimensions, based upon the actual picture size you have uploaded. For the Thumbnail View there are two options for the layout. Notice in the Directory Viewing Preferences screen above, you can have either the picture to the left and detail information to the right or the picture with the individual names below the picture. You may chose either type using the radio buttons. 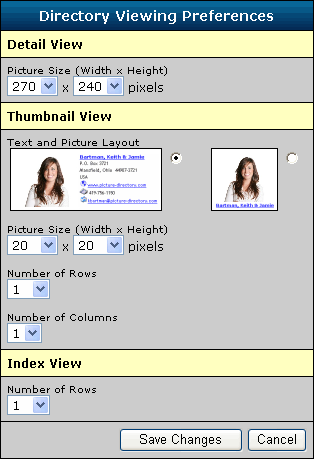 The picture width size can go from 20 to 250 pixels and the height size from 20 to 250 pixels. You may have a maximum number of 5 columns and 14 rows. For the Index View, you may have from 1 to 49 rows (i.e. one row for each individual/family). Again there is a dependency upon the screen definition to fit the maximum number of rows an individual may see in the list.